Last September, we had the great opportunity to visit the Czech Republic as part of our first press trip. Quite suspiscious at first regarding this offer that seemed too good to be true, we were then pretty excited at the idea of discovering this country we knew nothing about. For logistical reasons, we had to land in Prague 24 hours prior to the press trip which allowed us to set ourselves up with a quick tour of this oh-so romantic city. 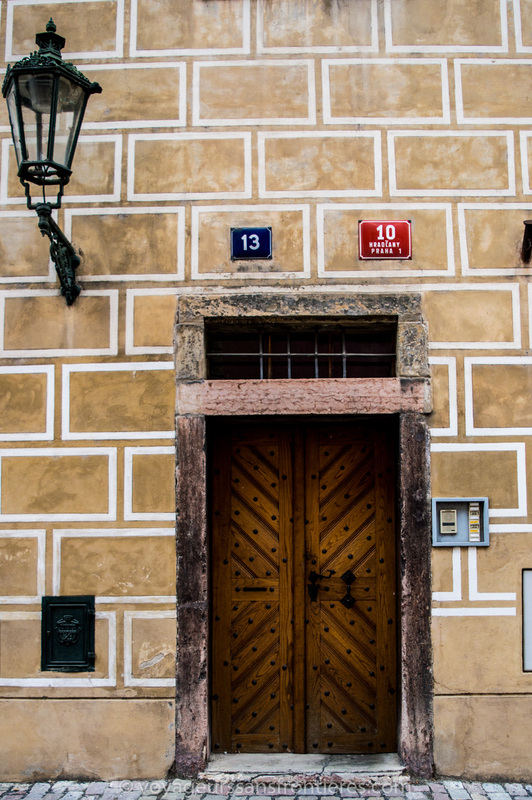 In this article we will give you all the keys to organize your weekend in Prague the best way possible! We opted for a direct Lyon–Prague flight operated by several airlines such as Air France. On the day of departure, we left Avignon in the early morning to reach Lyon by car and it was a hell of an adventure in itself! We literally had to go through a big storm (there was a weather orange alert for rain and hail!) and we often seriously thought that we were going to miss our flight as the elements were considerably unleashed reducing visibility on the road, and therefore our speed! Once we got to the airport, we quickly parked the car, jumped into the airport shuttle and ran across the airport to finally be able to breathe a huge sigh of relief once arrived at the departure lounge only 10 minutes before our plane was supposed to take-off! Two short hours later, we arrived at the Václav Havel airport in Prague and we were very pleasantly surprised by the summery temperature. Reaching the city center is simple. We just took the 119 bus to the Nádraží Veleslavín subway station and then take the subway to Jiřího z Poděbrad to get to our Airbnb apartment. 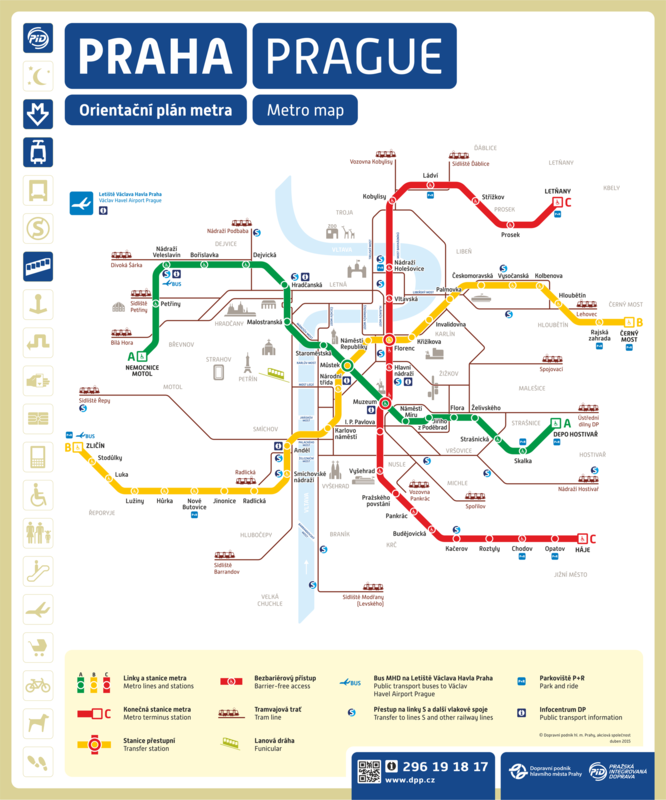 There are only three metro lines in Prague so it’s pretty easy to find your way even if the names of the stops remain unpronounceable, here is the subway map! We were meeting Jana, our host who took care of settling us into her apartment and the least we can say is that we were welcomed like royalty! The apartment itself, is very spacious and well decorated. It is a beautiful bright and very charming renovated loft located at only 20 minutes walking distance from the historic city center. Very welcoming and attentive, Jan and Jana had previously mailed us Google Maps infos to reach the apartment and numerous tips on places to see and restaurants to try out in the apartment’s neighborhood which was much appreciated! They were very accessible and attentive during our stay and we thank them warmly! Best of all, a portable wifi is provided for the whole duration of your trip so you can easily post your photos live on Instagram for free, needless to say that this is something that totally won us over :p! An apartment to book with your eyes closed! After dropping off our stuff and freshening up, we went out to eat at the Kopyto restaurant which is right acoss the street from the apartment. It is a small traditional restaurant that was highly recommended to us by Jana. It was already 3pm and we appreciated this well-deserved break in this quiet restaurant with a sunny terrace. The first contact with our waitress was friendly but a bit complicated: she hardly spoke English and our Czech was still in its infancy. With her help and patience, we were able to decipher the menu written in Czech and we opted for the Vepřový Saslik na jehle s cibulí has klobásou s hořčicovou omáčkou, dušená Ryze (Roll your mouse over the text for translation!). It was a very simple yet absolutely delicious dish and really cheap for our French standards! We ate for approximately €10 ($11) with our 2 courses, 2 drinks, water (yes, when asking for water you should specify that you want tap water otherwise they automatically serve bottled water to tourists) and a coffee! Finally came the time to explore Prague, this oh-so romantic town. Having very little time, we sticked with the basics but it is certain that Prague has much to offer if you take the time to go off the beaten paths. Entering the old town is through the Powder Tower, a huge adorned with many sculptures edifice that was originally one of the gates of the medieval fortifications of the Old City. A little further on, we reached the famous Old Town Square that’s surrounded by imposing fairy tale-like buildings. It is a busy and lively square where you will see many street performers each more talented than the other. We came across a very talented pianist who had fun making a giant blind test for the dozens of spectators that were surrounding him, it was really nice! This is also where you will find the Tower of City Hall, a must-go for enjoying a stunning 360 degree view on Prague including the beautiful Church of Our Lady before Tyn with its pointed spiers and the famous Astronomical clock that kind of disappointed us. Built in the 13th century, it is one of the major tourist attractions of Prague. We have to say that its golden face is absolutely gorgeous and is technically quite impressive. It consists of several sections that indicate for local time, the positions of the Sun and Moon in the sky and the astrological sign in which we are at the moment. It is topped with 4 pretty little automatons representing Vanity (with a mirror), Greed (a Jewish merchant with a hooked nose and a purse), Death (a skeleton with a calling bell) and Envy (a Turkish prince with his mandolin) that come alive every hour accompanied by the Apostles parading behind a window. We waited for this show with more curiosity than excitement but it still disappointed us. Admittedly we were unlucky. When we were there, Death (which is supposed to set the tone of the animation) and Envy were absent, certainly for repairs, and we imagined that the apostles would parade before us, not behind a simple window. Needless to say, we were therefore skeptical when the audience applaused in the end! Last stop of the day: Charles Bridge, the symbol of Prague. You will find there many musicians and street vendors. The atmosphere there is very friendly and bohemian. Bordered by numerous statues, it is one of the must-see attractions of Prague that naturally finds itself packed with tourists! Taking nice photos without a stranger on it then felt like an obstacle course! We started the next day with a delicious breakfast at Café Jen, who was recommended by the Prague Tourist Office. The place is very friendly and very well located in a quiet area but it was quite difficult for us to get there with our loaded suitcases. This is when we found out that some streets in Prague can be pretty steep and the pavements did not help! But the reward was beautiful and we ate very copiously with our breakfast of champions! Now off to the Prague Castle we had the chance to visit as part of our press trip. It is the biggest castle of the World and the least we can say is that there are a lot of things to see there! This is where we witnessed the Changing of the Guard that takes place daily at 12am precisely before the majestic Titans Gate which is named after the two statues of the struggling Titans that mark the entrance to the First Yard of the castle. We were surprised by its rapidity and the lack of fanfare and trumpets for the Changing of the Czech Guard (yes, we are beginning to be experts after seeing the Changing of British Guard and the Changing of the Swedish Guard !) but it was still nice to see. We fell in awe of the majestic Saint Vitus Cathedral, the largest church in the country. Its main entrance, richly decorated with many sculptures, is absolutely superb. It’s always fascinating to see how such a huge majestic building can harbor as many details that were meticulously devised by its designer, enough to give a whole new dimension to this 14th century building. A little further away is the Strahov Monastery and its worldwide known library of Philosophy. It is just one of the most beautiful libraries of the World and once inside, we totally understood why, it is truly dazzling! It was however quite frustrating to only admire the place from the hallway, huddled behind a thick cord (imagine the battle to take pictures!) and be aware that, if admission is charged, you will have to add a little extra to have the right to take pictures and a little more to film! The visits of the Prague Castle and Strahov Library were conducted as part of a press trip organized by the Czech Republic Tourist Office. However, all opinions expressed here are our own. A big thank you to our great guide Martin and Marek who bent over backwards to please us! In Czech Republic, each building has a číslo popisné (description number) in red and číslo orientační (direction number) in blue. The red number is unique for each building of a neighborhood, and may not follow the numbers of the nearby buildings, while the blue number just refers to the location of the building in the street. Thus, sometimes the two numbers are used in an address starting with the red number to avoid confusion. Find a cheap flight to Prague! N.B. : The Prague 1 and Prague 2 districts are the closest to the city center of Prague. Greed is a “Jewish” merchant. It is easy to see why Jews are leaving France. Antisemite! Hi John! Just to be clear, when we write a blog post about a place we visited, we like to do some research about it. This is exactly what we did in order to talk about the Astronomical Tower in Prague. We thought it might be interesting to dig a bit into its various symbols and their meaning. And yes, those symbols which generally came from darker ages, might reflect the racism of those times. The fact that Greed is represented by what’s supposed to be a Jewish merchant clearly has nothing to do with our personal opinion. To be honest, it couldn’t be further than our personal opinion! We didn’t make it up or read into it, we just did some research about it, maybe you should too. Remember that the Clock was built in the 15th century by one man who apparently had his own ideas and stereotypes in mind ;)! Have a nice day and please, don’t get stuck on a stereotype you might have about French people. The only stereotype we do live up to is that we love great food :)!